Today’s ride took me to the Peach Valley Recreational Area outside of Olathe. It’s accessed from Highway 50 by traveling east on Falcon Road. A warm spring Saturday brings out the crowds! The parking area is large, well-maintained, and equipped with a restroom. The parking area adjoins more adobes. Lots more adobes. In fact, I think there are several hundred possibilities for making a loop. 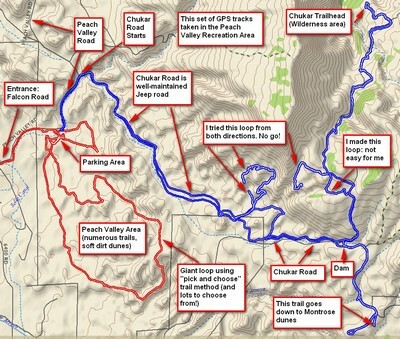 The GPS track shown in Red is how I found my way through the adobes. There’s lots to challenge beginners and intermediates, and if you fall down it’s all soft dirt. I turned up the speed a bit and tried out the skills I’ve learned and really hopped among the adobes. I’ll admit to an adrenaline rush. But one leaves the adobes quickly. 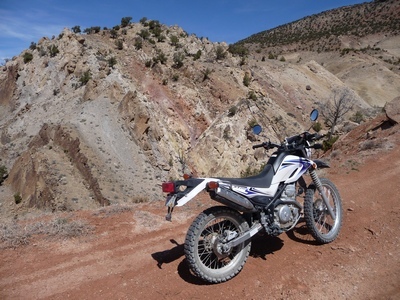 Chukar Road is a well-maintained road (I’d recommend motorcycle, ATV, or 4WD such as a Jeep) that leads up into the Gunnison Gorge Wilderness, ending (eventually) at the Chukar Trailhead. 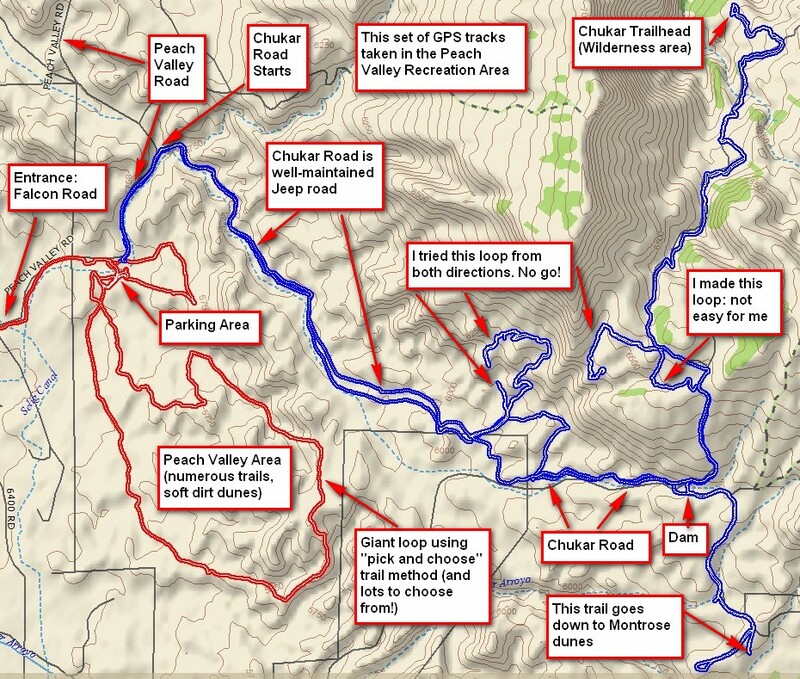 There are many designated single-track trails taking off from Chukar Road. I followed several. In most cases, I found that my intermediate-level skills were not enough, so I turned around and went out the way I came in. These aren't adobes! This is a trail that goes well up into the hills. If you fall down here, you'd better be wearing protective clothing. Some parts were steeper than I wanted to attempt. All in all a very enjoyable day, though I did drop the bike twice in some really rocky and inconvenient places. In one spot I was easing my way over a large rock and grabbed a tree to steady myself. Unfortunately, the branch came off in my hand (long dead) and I found myself needing to pick up the bike. Only my pride was injured. Oh…one more photo…someone had too much time on their hands. 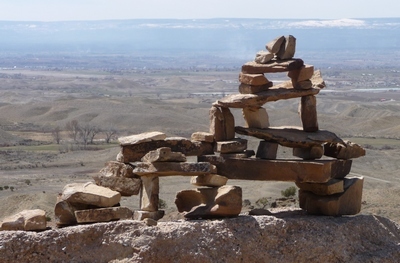 Interestingly, this little structure was way up high on one of the rocky trails. I doubt seriously that it’s of ancient origin. Someone spent some time on this. No, it's not Stonehenge. It's about six feet across and just sits on that big boulder.